An eccentric way to make your Android smartphone Faster. Home » Android » Download » Tips And Tricks » An eccentric way to make your Android smartphone Faster. Here I'm going to share an eclectic Tips to make your Android Smart phone faster than never before.Google tried to make android OS user friendly as possible as.but more facility means more programs to be installed on phone.So that each any every new application make your phone awesome but another crucial thing is that will also slowdown your phone. Because some application running in background every time,Even though you restart your phone these applications automatically start and again start running in background and it will also drain your battery too. 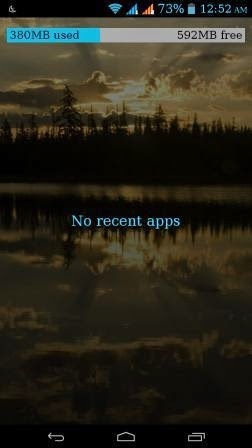 These applications uses more RAM and also decrease your battery performance.every application need some of memory from RAM to continue run some processes.If you have low-end Device with 512B RAM you can feel that your phone may be laggs every time and it will restrict you to play some games or use third party apps.Sometime the device itself use more that half of your total RAM memory.and rest of the memory you can able to use for your favorite apps or games. Most of time there is two types apps may slowdown your phone. One is Third party Launchers and Second is Social apps.Some times some other apps may also running in background even though you are not currently using it. These are the major reasons that, why your smartphone is not behave normally.But don't worry, here i will share some tricks with you that will make your smart phone again normal and more faster. There is one way to deal with this problem, that manually apply force close to these applications.you can do it with following steps,just go to setting> Apps >Running and tap on any third-party app and then tap on force close.it will release some amount of RAM for you.but still its not smart way. because no one would like to do this procedure every time.And it boring too. In this way you can optimize you phone up to 25%-30% with direct use of third party app like battery saver,Ram optimizer etc. These are the application which will give you more advance option for customization.You can easily stop the unwanted background ruining apps with just single click. here is some of most famous apps i'll going to share with you. Professional, easy to use and supporting 19 languages, Battery Doctor by Cheetah Mobile (formerly known as KS Mobile) gives a longer life to your Android phone , provides you with detailed battery information and helps it charge healthily with our unique 3 Stage Charging system. Enjoy an incredible power saving experience that's as good as Project Volta, even before Android L comes out. Super small, stylish sleek. APUS Launcher speeds up your phone and optimize your home screen. APPs DISCOVERY - APP RADAR to discover popular apps around you. APUS Launcher, the smallest launcher in the world with only 1MB; the fastest launcher for app organization and recommendation. “This launcher is just simply fantastic. It's easy to use and very fast. " -- TECHTOM https://www.youtube.com/watch?v=StHoeSgkLNs“The UI is clean and easy to use and it automatically categorizes your apps into smart folders – which is a really nice touch.” -- PocketTechGuide. Thanks to every user. You are the great source of innovation and motivation. We are always looking forward to hear your voice and help us improve.. Since the first Android phone in 2008, by now there are 3 billion+ Android users and thousands of different Android products. But all these products had one complaint; its OS is slow. Unbearably slow. In July 2014, a group of young and dedicated Android lovers were gathered with the determination of looking for a solution. We admired the freedom and the speed of Apus* bird. Our vision is to provide the best mobile experience to all the android users around the world. Our Mission: Provide outstanding mobile phone experience and services for users all around the world. Our Products: APUS Launcher, APUS Power+, APUS Boost, APUS Tools, APUS Market. So far, APUS Launcher has over 30 million downloads on Google Play, ranked No.1 in 30 countries and ranked top 5 in 50 other countries under Personalization Category. In this method you can also save your ram by disabling or uninstalling unusual apps from rom and third party app too. You can do it either manually or using third party app. Description from play store:Featured as Lifehacker's Top 1 Utility in 2013 Best Android Apps (http://goo.gl/1VMwnE), Android Authority's Top 3 Best Root Apps (http://goo.gl/g0L0qZ). The hardware of smart phone is upgrading day by day to improve speed and performance but other side one crucial thing is software is also upgrading day by day, and thats why you will never satisfy with your smart phone. thank you for sharing i never heard this before..!